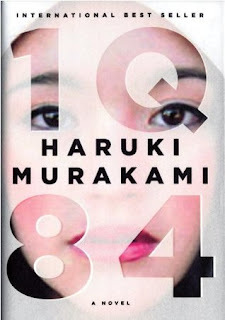 "1Q84" is long. At 1,000+ pages, the book is comparable in length to epics "Infinite Jest" and "2666", but make no mistake, in style and tone, the novel is pure Murakami. A little basic info on the novel, but not so much, because this isn't a synopsis or even a review: "1Q84" follows Tengo, a math teacher and writer, and Aomame, a yoga instructor/assassin, in alternating chapters, as they deal with their new surreal reality, both having fallen into a new world that is being manipulated by strange mystical creatures known as: the Little People. The book is separated into three sections, or in the case of the paperbook volume (which I purchased because it looked awesome), three books. Sometimes, you should buy a book just for its' cover! Right? 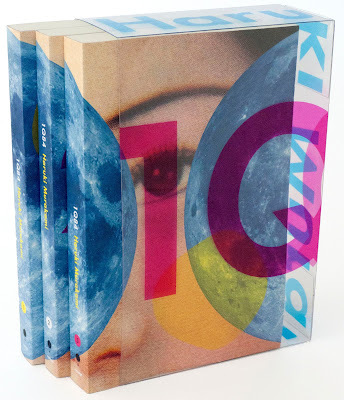 "1Q84" may have been the most frustrating reading experience of my life. Take for example Book III: which has one of the main characters stay nearly 300 pages stuck in one room. Also in Book III: another main character spends almost as much time speaking to his father, who is in a coma. Passivity in protagonists is not unusual for a Murakami book. In "Hard-Boiled Wonderland and the End of the World", the narrator does his best to stay out of the complex, fantastic narrative surrounding him. In "Norwegian Wood", Toru Watanabe, a young man in late 1960's Japan (and in one of the few Murakami books that take place in a realistic setting), let's supporting characters lead him from one moment to the next. 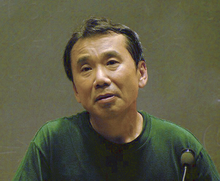 Murakami's protagonists aren't just passive, they are willfully passive. Aggressive in their refusal to be significant. So, it shouldn't be surprising that the characters in "1Q84" would follow this pattern. Hell, I began reading this book expecting that. Here's where the "1Q84" becomes frustrating: the Story never pushes back. Or at least not enough to overcome the prosaic protagonists. Okay, it almost does. Book II has some huge plot points. But by the time Book III rolls around, all of that becomes foreground, dimmed. Book I takes its time setting up this strange new world, of underground cults and two moons in the sky and fantasy books born from reality. By Book III, we're stuck in a room or sitting next to a hospital bed. Book III is about characters. Which would almost be okay, if Murakami wrote amazing characters. But he doesn't. The worst part is, they are disingenuous. Both Tengo and Aomame have the same thoughts over and over again, the main one being that they want to see each other again (they met as children and fell in love). But they do very little to make that happen, despite the fact that almost every chapter has: "I must see them again" repeated ad nauseum. They are passive protagonists that don't think like passive protagonists. This makes them frustrating. How many times can you stand hearing from a friend that they must do something when they never pull through? And the Story never forces them to pull through. The Story itself becomes passive. The sinister threat with its amazing foreboding in Book II is barely mentioned in Book III (until near the end, but not as much as you'd think). And there are some amazing things that are brought up - complex ideas that get my mind racing and the pages turning. This Story is breathtaking. So why does Murakami abandon it? Supposedly, Murakami does not plot his work. He just writes. Some doubt that, at this point in his career, he's even edited. Maybe this should be commended. But I can't help wondering how perfect the book could have been if Murakami paid off some of the startling ideas he had introduced. What experience I would have had reading the book if the central conflict wasn't muted, if a final confrontation wasn't denied. But what responsibilities does an author have to satisfy his reader? What if the author doesn't care about the same things as his audience? What then? And the biggest question for me: When did plot become a writer's enemy? I'm not going to say what a writer should or should not do, what a story can and cannot be. I feel like the modern literary culture holds too many debates on what good fiction "is". For me, if a story works, it works. It's intuition and not necessarily definable. And Murakami's stories mostly "work" and connect with millions of readers, including me. That's why even with the problems I have with "1Q84", I gave it a 4 (out of 5). The book kept me reading and kept me interested, albeit frustrated. There are also some amazing chapters and unforgettable moments (I'd write more about them if this was a review). And, honestly, I miss the book. I miss reading it. To be more accurate, I miss this world that Murakami created. I miss it because I didn't get a proper goodbye. Murakami doesn't care about that. I do.